The illustration below sets out the typical format for a Cashflow Budget (click on image to enlarge). There are 13 columns and the first column is a Year Total column. It is important to note at the outset that the Total column is equal to the sum of all the months. If you look at Sponsorship, the total is $9,000 for the year, and this comes all in the month of April. Similarly, the Total for Athlete Development is $5,000 and this comes in two months, February ($3000) and April ($2000). Salaries on the other hand is $3,000 every month, and since there are 12 months, the Total for the year is $36,000. Look in the left column and you will see 'Opening Balance', 'Total Income', 'Total Expenses' and 'Closing Balance'. These are the main components that enable a calculation that predicts what the Bank Balance will be at the end of each month. Opening Balance (what you have in bank at the start) plus Total Income (what money comes in) minus Total Expenses (what money goes out) equals Closing Balance (what money you have left). January Opening Balance The Opening Balance is the amount of cash at the beginning of the month (1st day of month). The Closing Balance is the amount of cash at the end of the month (last day of month). Closing Balance = Opening Balance add Total of Income less Total of Expenditure. February Opening Balance The Opening Balance of February will be the same as the Closing Balance for January. The Opening Balance of any month will always be the same as the Closing Balance of the previous month. 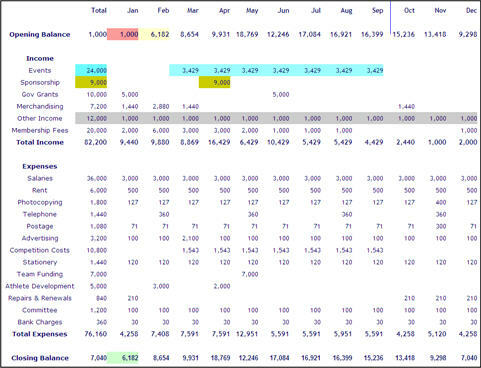 Events Income In a Cash Flow forecast the Total column will equal the sum of all of the months. In the situation of Events Income, this organisation plans to obtain $3,429 per month for seven (7) months. The other months there is no Events Income. Therefore the Total of Events Income for the year is $24,000. How does the organisation know or guess what income it will achieve in any one month. Well, the organisation will need to work out what events it will stage each month and calculate the likely income it will receive. Sponsorship In the case of Sponsorship Income, the organisation believes it has a sponsor who will pay up $9,000 in April. Other Income The Cash Flow forecast shows an amount of $1,000 per month for "Other Income". When preparing a Cash Flow forecast it is not always possible to have an idea of how much income will be received in any month. Therefore it is simpler to divide the Total by the number of months and every month has the same figure. The concepts and principles that apply to Income (as above) also apply to Expenditure.